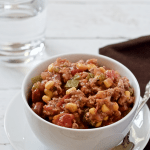 This 30-minute healthy southwest turkey chili with corn and black beans makes a great, easy dinner for a chilly night. Add your favorite toppings and get ready to dig in! I had my hair appointment Monday night (total #momlife move that I have to go get it done after my kids are in bed). I got my regular highlights to lighten up my hair and then I went for it. An idea I’ve had for months, have forgotten about and come back to, and decided to pull the trigger. I have a single small but beautiful strand of purple in my hair now. It’s a “peekaboo” style, so I can cover it up or show it off, depending on my mood. Purple has been my absolute favorite color for, oh, forever, and like I said, I thought about doing this months and months ago. I figured, it’s October, Halloween is coming, and why not?! 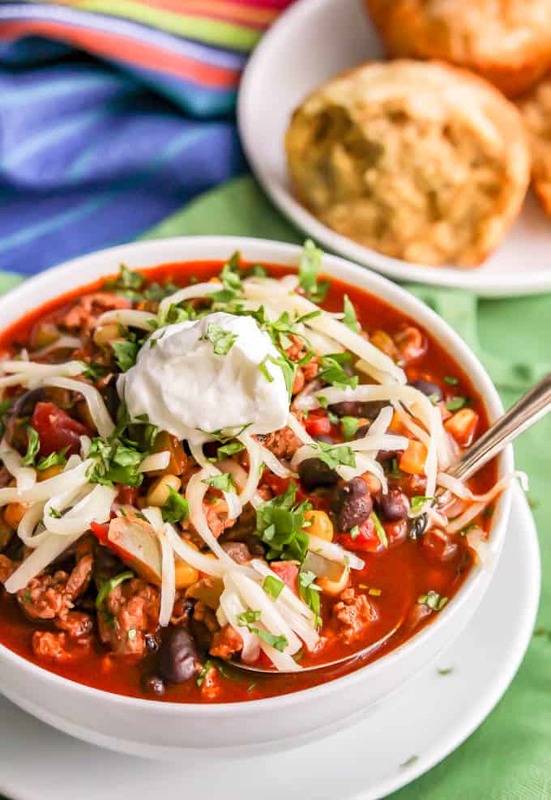 Today, it’s my healthy southwest turkey chili with corn and black beans, which has been a favorite of mine and my husband’s since before we had kids. I’ve made this recipe dozens of times, have fiddled with it over the years and just keep coming back to this version. 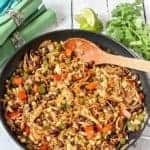 It’s full of ground turkey, black beans and corn, and tons of great southwestern spices and seasonings. You can use an 11 oz. 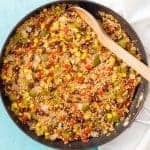 can of corn (yellow or white or mixed) or substitute about 1 cup of frozen corn for this recipe. 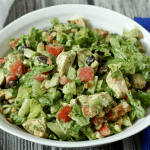 We prefer black beans but you could substitute kidney beans or pinto beans (or use 2 cans of beans to make this even heartier). I’ve added some zucchini along with the peppers before and that was really good too, if you want an extra veggie in here. I like my chili on the thicker side and find this is the right balance. If you like yours super thick, I’d recommend starting with just 1 1/2 cups of chicken broth and adjusting at the end when you are ready to serve. Alternatively, you can thin it out with extra broth if you want it a tad more soupy. And of course, add all of your favorite chili toppings! 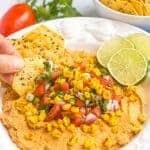 Shredded cheddar or Monterey Jack cheese, sour cream or Greek yogurt, diced avocado, chopped fresh cilantro, hot sauce, crackers or chips, etc. 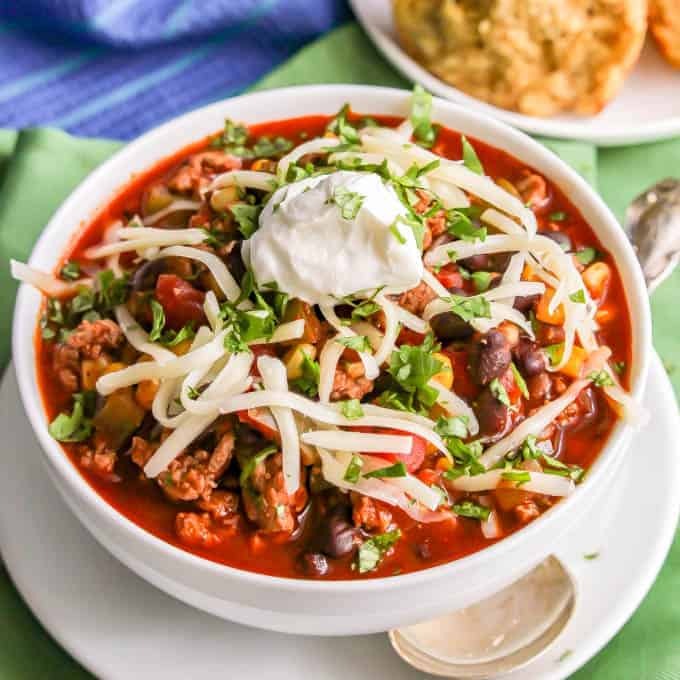 This southwestern turkey chili is also great for making in a big batch, because you can freeze the extras for another night! * Let the cooked chili cool down and then pack it up in a ziptop freezer bag or a freezer safe container. * Don’t forget to label it! I also like to keep a list of food I have in the freezer in my desk, so I can see what we need to use up without having to dig through the freezer. * To reheat chili, it’s best to thaw it in the fridge overnight. Then add it to a pan on the stove over medium low and bring it to a simmer. * If you’re in a pinch time-wise to thaw it from the freezer, you can place the frozen bag/container in a bowl of cold water to thaw it on the counter. Then heat it in a pan until warm and serve it up. * If the chili has gotten too thick, I add a few splashes of chicken broth to get it to the right consistency. 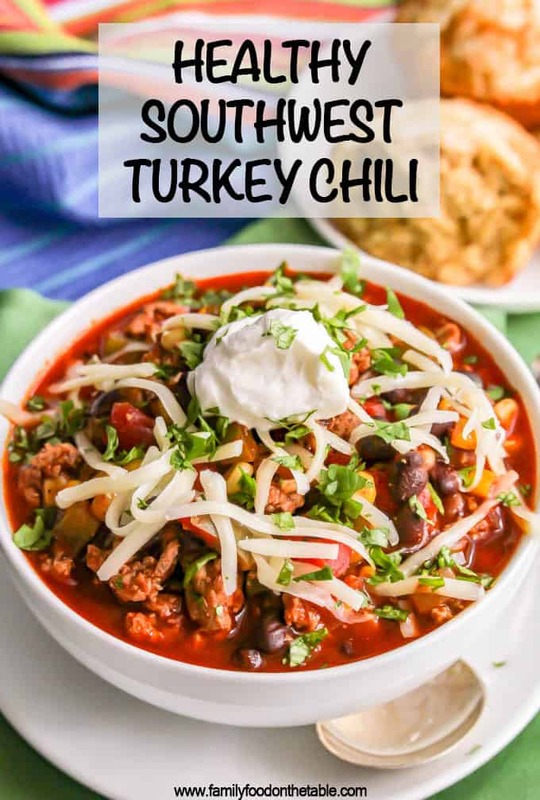 Whether for game day, family dinner or just when you need a warm bowl of healthy turkey chili to cozy up with, I hope you give this recipe a try! 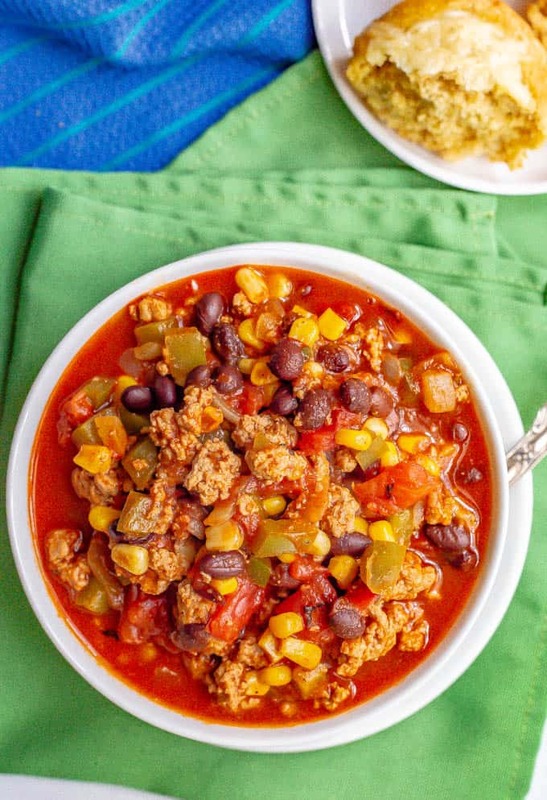 This 30-minute healthy southwest turkey chili with corn and black beans makes a great, easy dinner for a chilly night. Heat olive oil in a large heavy-bottom stock pot over medium heat. Add onions and peppers and sauté for 3-4 minutes. Add garlic and ground turkey and cook until the veggies are softened and the turkey is no longer pink. Add the chili powder, cumin, paprika, salt and cayenne and stir until everything is well coated. Serve with your favorite chili toppings and enjoy! I like my chili on the thicker side and find this is the right balance. If you like yours super thick, I’d recommend starting with just 1 1/2 cups of chicken broth and adjusting at the end when you are ready to serve. 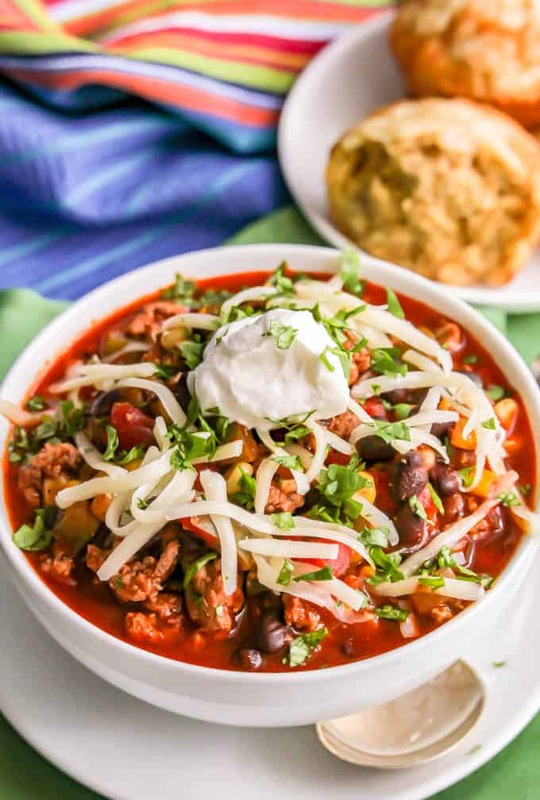 This chili reheats and freezes great, so feel free to double the recipe and keep the extra for another night! I love this hearty bowl of healthy goodness! 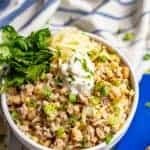 It’s so smart to use ground turkey or chicken in place of beef. I can’t wait to whip up a batch! Thanks Holly! I think you’ll love this chili!